If there is a clear association with another illness or the lung fibrosis is the result of a side effect from a medication or an exposure to an agent known to cause PF, then the cause of the disease is no longer considered idiopathic. PF clearly associated with another disease, such as scleroderma or rheumatoid arthritis, would be referred to as pulmonary fibrosis secondary to scleroderma or secondary to rheumatoid arthritis. There are no reliable data to determine how many people are affected by PF, possibly due to the large number of conditions under which it can arise. According to the ATS, the incidence of IPF was estimated at 10.7 cases per 100,000 per year for men and 7.4 cases per 100,000 per year for women in a population-based study from the county of Bernalillo, New Mexico. A study from the United Kingdom reported an overall incidence rate of only 4.6 per 100,000 person-years, but estimated that the incidence of IPF increased by 11% annually between 1991 and 2003. This increase was not felt to be attributable to the aging of the population or increased ascertainment of milder cases. A third study from the United States estimated the incidence of IPF to be between 6.8 and 16.3 per 100,000 persons using a large database of healthcare claims in a health plan. Idiopathic Disorders: Idiopathic Pulmonary Fibrosis(IPF), acute interstitial pneumonia(AIP), idiopathic non-specific interstitial pneumonia(NSIP), sarcoidosis. Connective tissue and Autoimmune disease: Sleroderma/Progressive systemic sclerosis, Lupus, Rheumatoid arthritis(RA), polyomyositis/dermatomyositis. Occupational and Environmental: Inorganic dust, organic dust, gases and fumes, radiation. Drug Induced: Chemotherapeutic agent, radiation therapy, antiarrythmics, antibiotics, anticonvulsants. Genetic/Inherited: Familial pulmonary fibrosis, Hermansky-Pudlak syndrome. Other factors associated with the disease is heavy smoking and acid reflux disease(GERD). The pathogenesis of IPF has been heavily debated among health professionals, yet two main considerations for the pathology of this disease have been widely recognized. Although the pathologial mechanism involved in PF is still unclear, health professionals recognize that the the condition appears to involve the cells that line the tiny air sacs in the lungs (alveoli). These are called alveolar epithelial cells (AECs). In IPF, these cells appear to become damaged and begin to die. The body tries to repair the damage by releasing another type of cell known as fibroblasts. The production of these fibroblasts goes out of control and they cause scarring and hardening (fibrosis) of the delicate tissues of the lungs. This leads to difficulty of expansion of the lung tissue- making breathing difficult in the affected patient. The lung tissue also has issues transferring oxygen to the rest of the body. Laboratory studies: Reportedly, up to 30% of patients with idiopathic pulmonary fibrosis (IPF) have positive tests for antinuclear antibodies or rheumatoid factor; however, these titers are generally not high. Chest Radiography: The typical findings are peripheral reticular opacities (netlike linear and curvilinear densities) predominantly at the lung bases (see image below). Honeycombing (coarse reticular pattern) and lower lobe volume loss can also be seen. 6 minute walk test: Desaturation below the threshold of 88% during the 6MWT has been associated with an increased mortality. Pulmonary function testing: In patients with idiopathic pulmonary fibrosis, a restrictive ventilatory defect is typically present. Vital capacity, functional residual capacity, total lung capacity, and forced vital capacity (FVC) all are reduced. Additionally, the static pressure-volume curve is shifted downward and to the right as a result of decreased lung compliance. Obstructive ventilatory defects are not common; however, if present, they may suggest the coexistence of chronic obstructive pulmonary disease. 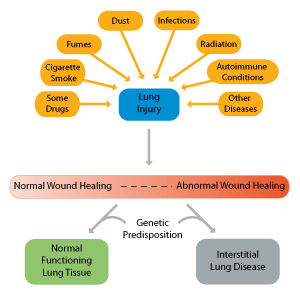 The exclusion of other known causes of interstitial lung disease (ILD), including domestic and occupational environmental exposures, connective tissue disease, and drug toxicity. The presence of a UIP pattern on HRCT in patients not subjected to a surgical lung biopsy. Specific combinations of HRCT and surgical lung biopsy pattern in patients subjected to surgical lung biopsy. Treatment courses for pulmonary fibrosis are highly variable and difficult to predict. Each therapy strategy is individualized according to the patient's history and symptoms. The non-pharmacologic treatment option is pulmonary rehabilitation. Pulmonary rehabilitation programs involve aerobic conditioning, strength and flexibility training, educational lectures, nutritional interventions, and psychosocial support. Pulmonary rehabilitation has recently been studied in patients with ILD. Two controlled trials of pulmonary rehabilitation in IPF have demonstrated an improvement in walk distance and symptoms or quality of life. Other uncontrolled studies have found similar findings. The beneficial effects of pulmonary rehabilitation may be more pronounced in patients with worse baseline functional status. Pulmonary rehabilitation may not be reasonable in a minority. Lung transplantation for Idiopathic Pulmonary Fibrosis patients confer a survival benefit over medical therapy. Due to the use of the Lung Allocation Score(LAS) IPF has now replaces COPD as the most common indication for lung transplantation in the United States. Due to the unknown cause of idiopathic pulmonary fibrosis, prevention of the respiratory disease is difficult. Higher prevalence of the disease is attributed with certain family genetics and cigarette smokers. As such, a physiotherapist can advise patients to avoid or stop smoking in order to decrease the chance of idiopathic pulmonary fibrosis. Maximize the patient's quality of life, general health and wellbeing. Educate the patient about PF, self management, ceasing of smoking, prevention of infections. Optimize lung volumes and capacities. Reduce the work of breathing. Maximize aerobic capacity and efficiency of oxygen transport. Optimize physical endurance and exercise capacity. Optimize general muscle strength and thereby peripheral oxygen extraction. Patient monitoring includes dyspnea, respiratory distress, breathing pattern(depth and frequency), arterial saturation, heart rate, blood pressure, and rate pressure product. patients with cardiac dysfunction or low arterial oxygen tensions require ECG monitoring, particularly during exercise. Breathlessness is accessed using a modified version of the Borg scale of perceived exertion. The primary interventions for maximizing cardiopulmonary function and oxygen transport in patients with PF include some combination of education, aerobic exercise, strengthening exercises, chest wall mobility exercises, body positioning, coughing, relaxation techniques, pacing and energy and energy conservation. An ergonomic assessment of home and work environments may be indicated to maximize function in these settings. Education includes information in preventative health practices, such as removing from the causative environment, flu shots, smoking reduction and cessation, weight control, hydration, relaxation, energy conservation. Manage and educate patients with comorbid medical conditions associated with idiopathic pulmonary fibrosis. Evaluate patients with idiopathic pulmonary fibrosis and determine whether they require lung transplantation . Establish an operational waiting list using the Lung Allocation Score (LAS) that prioritize patients based on the difference between post-transplant 1-year survival and pre-transplant urgency. Educate patients with food nutrition and proper dieting. Encourage obese patients with idiopathic pulmonary fibrosis to achieve ideal body weight. Responsible for improving quality of life and preventing functional impairment. Aid idiopathic pulmonary fibrosis patient with weight and disease management through musculoskeletal and cardiorespiratory conditioning. ↑ 1.0 1.1 Prasad R, Gupta N, Singh A, Gupta P. Diagnosis of idiopathic pulmonary fibrosis: Current Issues. Intractable Rare Dis Res 2015;4:65-69. ↑ 2.0 2.1 2.2 Pulmonary fibrosis foundation. About pulmonary fibrosis. (accessed 25 March 2014). ↑ 3.0 3.1 3.2 Medscape. Idiopathic pulmonary fibrosis. (accessed 25 March 2014). ↑ 4.0 4.1 Raghu G, Weycker D, Edelsberg J, Bradford W, Oster G. Incidence and Prevalence of Idiopathic Pulmonary Fibrosis. Am J Respir Crit Care Med 2015;174:810-816. ↑ 5.0 5.1 American Thoracic Society documents. An official ATS/ERS/JRS/ALAT Statement: idiopathic pulmonary fibrosis: evidence based guidelines for diagnosis and management. Am J Respir Crit Care Med 2011; 183:788-824. ↑ 6.0 6.1 Wilson M, Wynn T. Pulmonary Fibrosis: pathogenesis, etiology and regulation. Mucosal Immunology 2009;2: 103-121. ↑ NHS. Disease fact sheet: Pulmonary fibrosis (idiopathic). 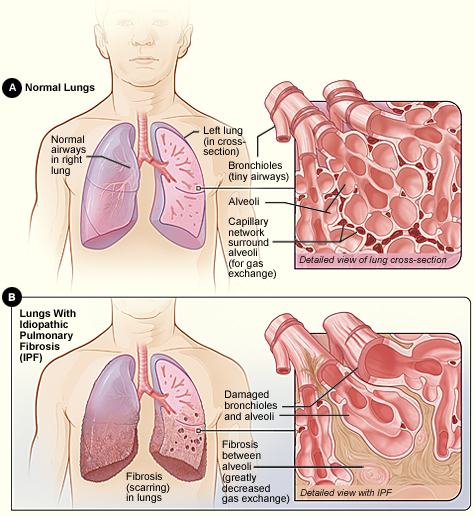 http://www.nhs.uk/conditions/pulmonary-fibrosis/Pages/Introduction.aspx (accessed 20 May 2015). ↑ British Lung Foundation. Disease Fact sheet: What is IPF?.http://www.blf.org.uk/Page/What-is-IPF (accessed 18 May 2015). ↑ Frowfelter D, Dean E. Principles and practice of Cardiopulmonary physical therapy. 3rd ed. St.Louis: Mosby-Year book, 1996. ↑ Prasad R, Gupta N, Singh A, Gupta P. Diagnosis of idiopathic pulmonary fibrosis: Current Issues. Intractable Rare Dis Res 2015;4:65-69.